Cate is one year old… talk about a fast year! With a birthday so soon after Christmas and the family just back from visiting Germany, the birthday was very low key. Though I still felt like I should make a special cake for a special girl. I got some time off work so I could go to Sacramento. I had been asked to babysit on thursday and friday. I jumped at that… anytime I can spend with my grandkids I’ll take. Cate is very close to walking; standing and holding on to furniture and walls as she goes. Elizabeth is three now and getting more and more independent. But, lucky for me, still good for a cuddle now and then. Since I was going to go a few days early, I figured out a cake I could make ahead and take frozen. Then I could have all the decorations made beforehand. I settled on the Cute as a Button theme…because she is! Colorful gum paste buttons and leaves. So, lots of gum paste buttons, some heart-shaped. Some giant and some tiny. Very colorful and fun. I covered a big number one candle in fondant to coordinate with the cake. I would cover the cake in light yellow fondant and decorate with the buttons. I mixed up a white cake, then separated the batter into six parts. I colored each part with a different color and baked each in a small shallow baking pan. I ended up with six colorful small cakes. When cool I cut each cake into 1/2″ cubes. Sorta looked like tiny sponges to me! 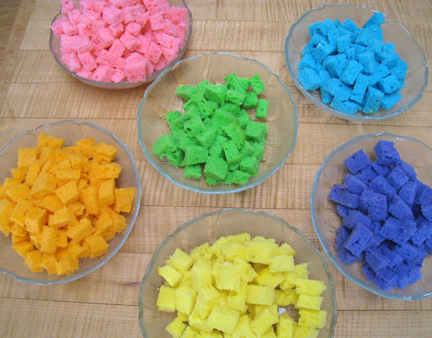 Lots of colorful cake cubes… orange, pink, blue, purple, yellow and green. I made a three layer white cake and some extra cupcakes. Since the technique I was using was for cupcakes I thought I’d see how that works too. I’m also more in favor of giving the birthday child a cupcake to eat instead of a whole cake to mess up. After mixing a white cake, I poured some batter into the 8″ round pans I was using. Then I put in the colored cubes of cake and spooned more batter over the cubes. I did the same for the cupcakes. As it turned out the cupcakes worked fine. I think because there was nowhere for the cubes to move to. The cake layers had their own problems. Tasted great, but most of the colors floated to the top of the cake and ended up getting trimmed off when I leveled the cakes. So, when I do this again, I will be putting more colored cubes in the pans and using a wet strip around each pan (which I always do, but forgot this time!). Colorful but not quite right… next time more cubes! Also, for anyone wondering… the cubes of cake do stay moist even after baking twice. The only dry parts were the ones that poked up through the top that got trimmed off. I made it to the kids house with frozen cakes and put them in the freezer there. I put the cakes together on friday with the Duncan Hines orange creme flavored frosting between the layers. 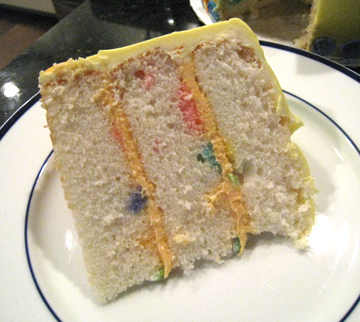 Then I crumb frosted the cake with the light yellow vanilla frosting. At that point, I decided to just go with the frosting and not use the fondant this time. Funny, but taking care of a one and three year old is a lot of work, if you’re not used to it! Great fun and special times, but no time to spend on the cake. Still wasn’t sure about how the top of the cake would look. Decided I needed a couple of larger buttons, so I got out the gum paste and Elisabeth and I made more buttons. She also helped me frost the cupcakes. Turned out to be a good helper too, as long as it didn’t take too much time. Saturday morning I started decorating the cake. First the buttons up the side and the big candle. Then I placed the other buttons and wrote “Cute as a Button” on the large button. For the finishing touch, I used extra buttons to surround the bottom of the cake. I left the cupcakes for last, asked Elisabeth if she wanted to help decorate and we finished them up with the left-over buttons. It was a very small gathering and the birthday girl was getting very tired. We lit the candle and her sister helped her blow it out. Then she got to have her own cupcake, which she devoured. It’s been a pretty busy winter for me. Holidays as usual, but I started working again on the first of December. Work really does interfere with life! So, I started Christmas gifts early (for me). I decided to knit hats for my elder son’s family. They were planning a trip to Germany over the holidays to visit family stationed there. Since they were leaving on the 19th, we decided to celebrate our Christmas on the 16th. Great. Now it was going come even faster! I decided to start with the girls hats. I saw a cute knitted hat that was made to look like a cupcake. Perfect, right? I did not realize it was going to take me four hats before I figured out how to do it (I did not have a pattern). Then there was guessing the right size. I did have my son measure the girls heads. They weren’t that different, at least in the knitting world. Don’t know if that was good or bad. 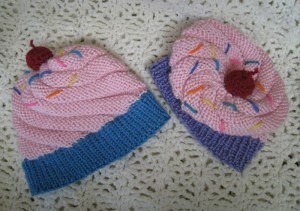 Toddler size cupcake hats with a cherry on top! By the time I got the pattern figured out I decided to make the same hat for each of the girls. One with a blue band and one with lavender. I still had lots of yarn and I could just picture the girls heads bobbing in the crowds. They would be easy to see anyway. As simple as hats are I seem to have trouble with the bands. I’m either making them too tight or they tend to stretch too much and don’t feel snug. At times I actually felt like going somewhere to find a child to try these on. It turns out that I have a small head and not that much bigger than either of my grand daughters. So I was constantly putting it on my head to gauge the fit. The unfortunate thing is that you can’t try it on until it’s almost finished! And the fact that these were knitted flat and sewn up after the band was knitted. Two colors of tweed with stripes make this a hat for anyone. The next hat I worked on was just a simple tweed with stripes. I figured my son would like it simple… it would go with anything. I started with the brown tweed and added a couple stripes of grey tweed before starting the decreases. 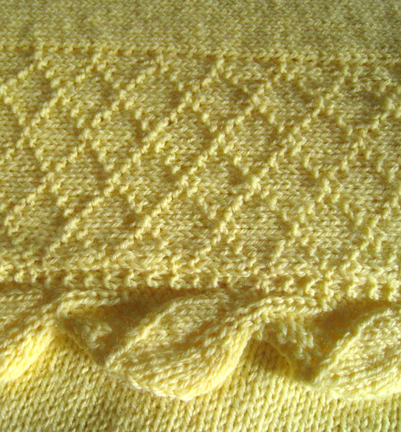 Again I was working without a pattern… I seem to do that a lot. Then my friend came over. 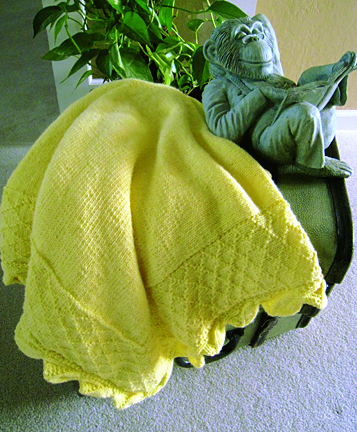 She goes to a needlework class every week and knows someone who collects patterns for knitting and crocheting. I was lucky that she was able to borrow a few binders (yes I said binders) with hat patterns in them. I actually found a pattern that would be perfect! This hat went much faster that the girls’ and the size was no problem. Amazing how fast it can go when someone else does all the thinking. Yea! At this point I was feeling pretty good… I just might finish everything in time for our early Christmas. Large wooden button on a seed stitch band add great detail to this hat. I had an idea for the type of hat I would knit for my daughter-in-law. A wide band in a seed stitch with a large wooden button. 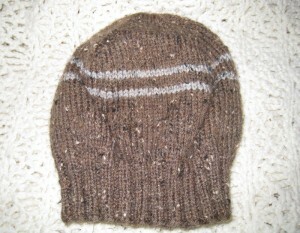 I would use the tweed grey yarn I used for the stripes in my son’s hat. After searching the internet I found a pattern that was similar to what was in my head. I really liked the way it turned out…simple, but with the details of texture and the wooden button. I did finish all four hats in time, but it was close. Work and doing some woodworking for other gifts made the time fly. We had a great time… my two boys, their wives and the five grandchildren. I am blessed. Rachel is having a Build-a-Bear birthday party this year. The girls are meeting at the mall and they get to pick out the bear they want to build. I had never been to a Build-A-Bear Workshop before. I was so impressed with the idea… wished I’d thought of it! Take a bear that is all ready, except for the stuffing, and create a whole personalized, fun experience to finish the bear with hearts, name and birth certificate. Wonderful! As for the cake, Rachel asked for something that looked like stuffing and a teddy bear. Well, after a couple texts and phone calls I asked if she would trust me to make an appropriate cake for her party. She said she would. 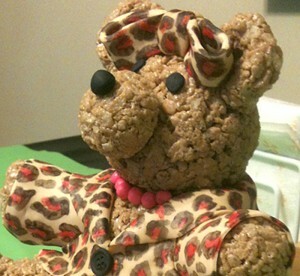 Fondant leopard coat on cereal treat bear. My first thoughts were to make something simple. I had just started working again and was going to have to work around my schedule. A big cereal treat teddy bear sitting on “stuffing”, aka cotton candy. I wanted to make the leopard print on the inside of the cake but ended up swirling the chocolate, vanilla and bright pink cake batter together. I was able to make the teddy bear and bake the cake a couple days early. This bear I wanted to be a little darker in color, but using Cocoa Krispies makes it too dark. I actually found ice cream flavored marshmallows! They came in white, tan and pink ice cream cone shapes. When melted and mixed together it became a golden tan color. Perfect. Instead of leopard on the inside I decided that I would make a leopard print jacket for the bear and wing it from there once I got the cake put together. Day of the party… I stacked and frosted the cake early in the day. Then covered it in bright pink fondant. Next came the jacket for the bear, which I made of light golden fondant. Then I painted the pink and dark brown leopard spots with a mixture of petal dust and lemon extract. I liked the look of that and added a bow for her head and a band around the base of the cake. I put a large fondant button on the jacket and the band and for a finishing touch I added a pink pearl necklace. The cotton candy stuffing would have to wait until later. It shrinks and goes flat if left in the air too long. So, I would be putting the cake together after the trip to the Build-A-Bear Workshop. As soon as the girls finished making and dressing their bears we headed back to the house for pizza and cake. While the girls were checking out their newly adopted bears, I put the cake together. All I had to do was to pull out some cotton candy and set it on the top of the cake, then set the bear on top. There it is! 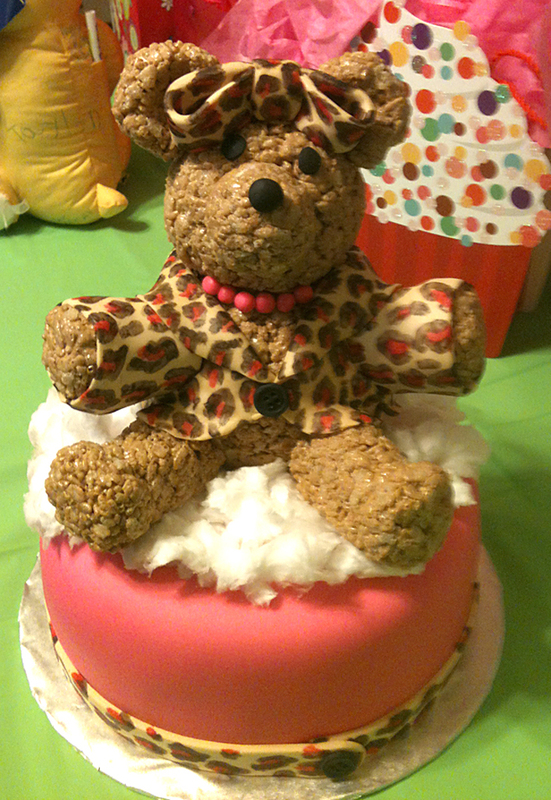 It was a fun evening and Rachel and the girls loved her teddy bear cake. Happy Birthday, Rachel! My dear friend’s son turned 30 this year. Joe’s birthday is very soon after Thanksgiving and I didn’t do anything until after that weekend. I would be starting work on the first of December and had a lot to finish up before my time got eaten up with work! Luckily, this was not a huge project and I was more than happy to do it. Our idea was to go with Metal Mulisha… he wears a lot of it. As does my younger son. So, I was familiar with it. I went online to find a picture of the skull with the helmet I knew was part of the brand. 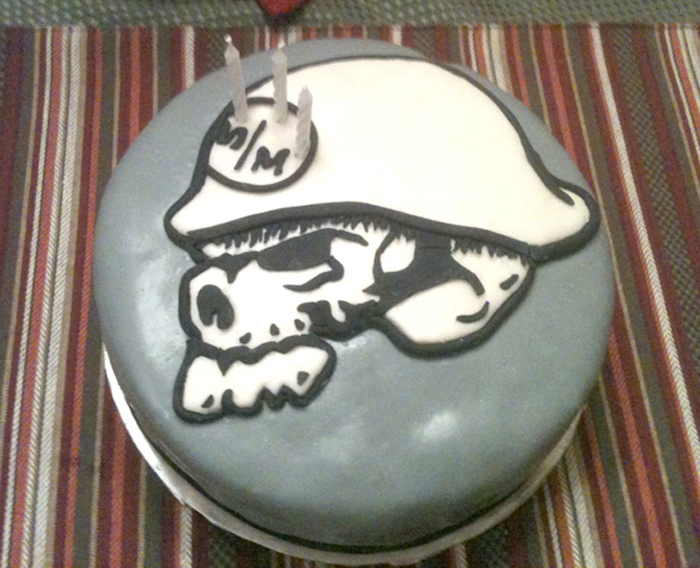 In no time at all I found what I was looking for and then traced the photo in Illustrator so I could size it to the cake. 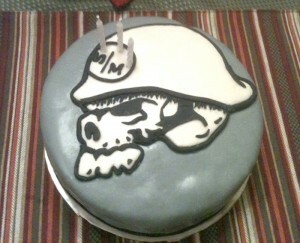 An eight-inch round, two-layer, red velvet cake would mean I didn’t have to go very big with the emblem. Just big enough to handle the details easily. I colored the fondant grey and went with the white emblem with black trim. One candle for each decade and another great year to come! My son, Mike, mentioned something about making a couple of puzzles that could then be intertwined for a larger puzzle. Good idea! For Christmas I would give a set like that to his soon-to-be three-year-old daughter Elisabeth. 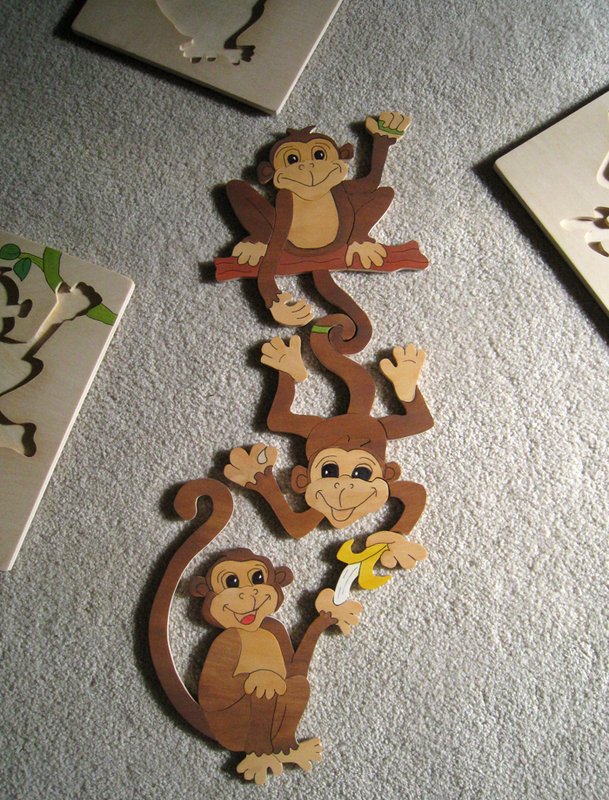 I set about designing a trio of puzzles with monkeys as a theme. I was going to use a brand of colored dyes that I bought a few years ago for these puzzles. But in researching I discovered that the company that made them is no longer in business. I hate when that happens! So, I ended up just using watercolor tube paints that I watered down for a translucent look. 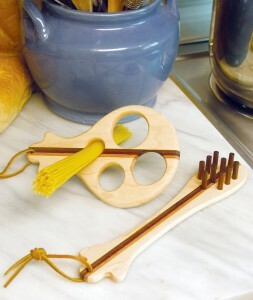 The thing about using a water-based anything on the baltic birch is that it will raise the grain. Not to worry, just put it on as dry as posible and plan on giving it a light sanding before finishing. I have found that using a scrap of a brown paper shopping bag works wonders… it “sands” down the grain without taking off too much paint. I used a black Sharpie marker to put in the details. When thoroughly dry, I sprayed with a clear gloss. I had fun making them… I hope the kids have fun putting them together, individually or all three together. This is one of my favorite puzzles! I think it’s because the colors are so bright. I don’t know… it just makes me smile. 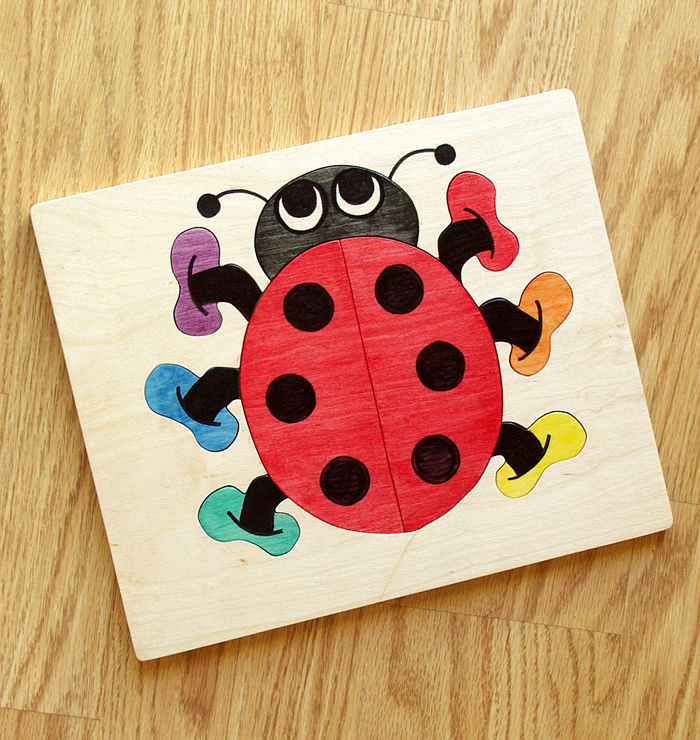 Bright colors, happy feet make this nine-piece puzzle fun. 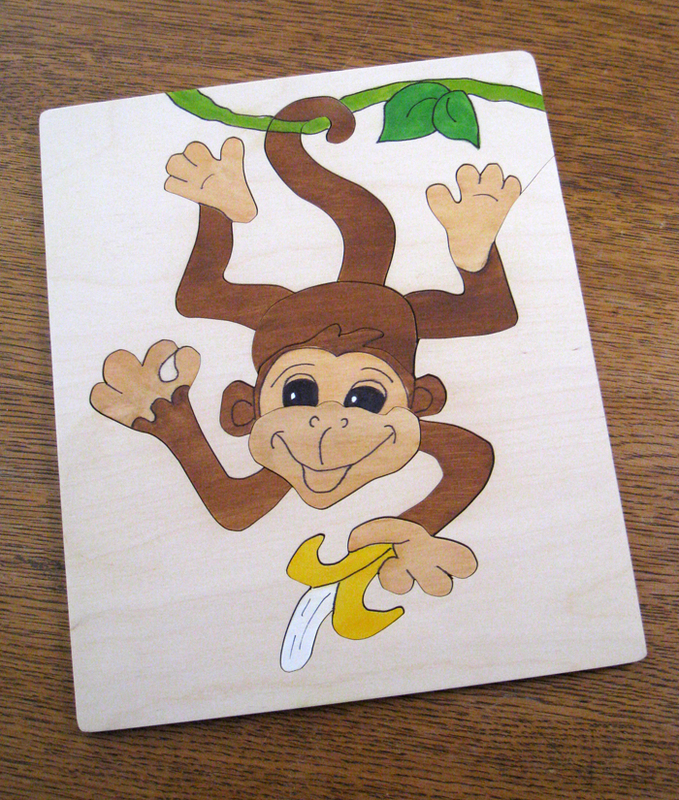 I designed this one a few years ago when I gave a class on making children’s toys at a local hardware and woodworking store. 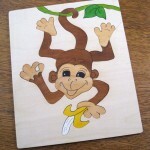 I have since put it up on my woodprojectsonline.com website. It was the first time I used the birch plywood and I was anxious to see how the colorful wood stains would look. I loved the way it turned out! When I went back to check on the availability of the wood stains I found that the company has gone out of business! Now what to do? Because I was working with plywood I couldn’t use a lot of water to thin acrylic paint for a translucent look. After a little research I decided to try watercolors that come in tubes. With just a damp brush I could get the look I wanted, without too much water. The only problem came when trying to figure out which foot went where… all are slightly different. For the little ones I decided to place a matching colored dot underneath each foot on the puzzle tray with permanent markers. Since then I have figured out how to make the dots temporary. I now use a small round white sticker with a the colored dot on it. When your child gets better at the puzzle you can just peel the sticker off! 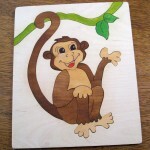 I have a website that sells woodworking plans. For over eight years I was an Associate Editor for a woodworking magazine called Weekend Woodworking. My job included designing, building, photographing, and writing articles for woodworking projects that could be made in a weekend. I loved that job! Then the day came when the boss said he was going to stop publishing the magazine. What to do now?! My friend (the editor) and I decided that since we loved what we were doing we would continue doing it. But we had to take the expensive parts out…printing and mailing. So we created a website where people could download a pdf of a woodworking plan, print it out and then take it with them to the shop. Use these beautiful hardwood utensils to measure out spaghetti and to serve when cooked. A while ago my business partner left the area and I decided to keep woodprojectsonline.com going, but it would need a major overhaul. Along with the website update I wanted to have new projects to upload. I found a couple of almost finished ones in the garage. Gotta love that! This last week I have been working to get those finished and published. I have also created a few new, quick projects, mostly children’s toys that I thought I would put in my portfolio here too. I’ll blog about those projects soon. 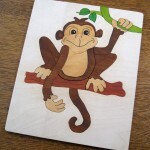 I really enjoyed making this project… laminating layers of wood to create a more colorful design in the wood. For this set I used thin strips of purple heart wood, oak and walnut in maple. 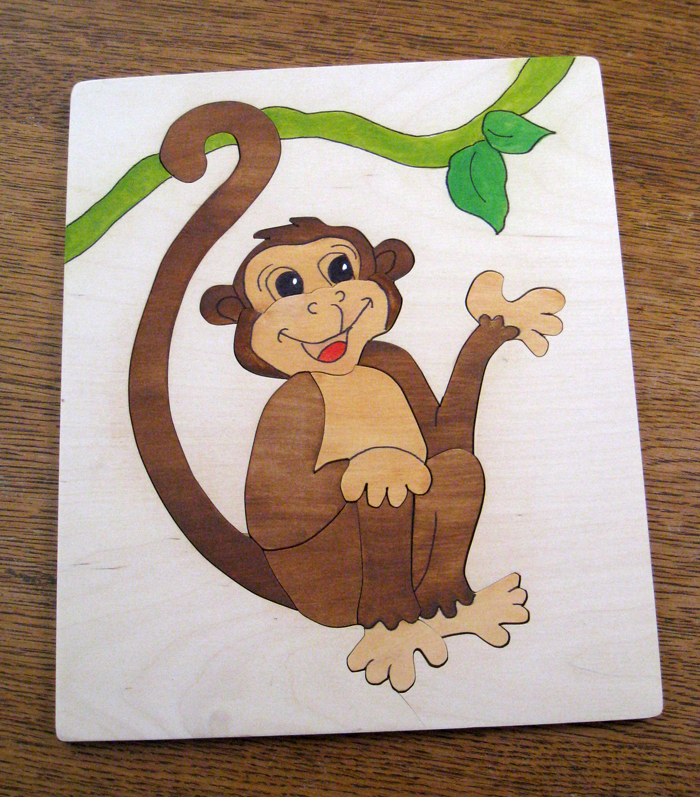 It’s great to use specialty hardwoods in small amounts to add something special to a piece. I’m going to go through all my lumber and see what I have. 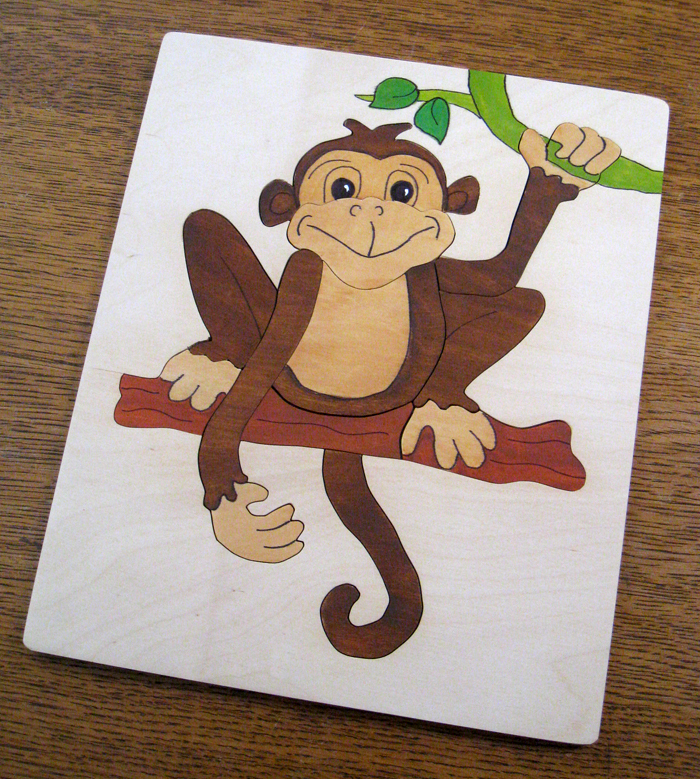 I am really getting enthused about working with wood again … Yea! I have to admit that I have been remiss in seeing all the new (new, being relative) Disney films. Who knew there were so many princesses out there! In my day we had Cinderella, Sleeping Beauty and Snow White. Their popularity seems to last forever and I bet that’s why Disney decided to add a princess, a year, to increase the marketing. Good for Disney. We are inundated with princesses and I really don’t like to use copyrighted characters on my cakes (or any other projects I do), you can get those cakes other places. So, I thought I would just go with the feeling of a princess… pink and sparkly. 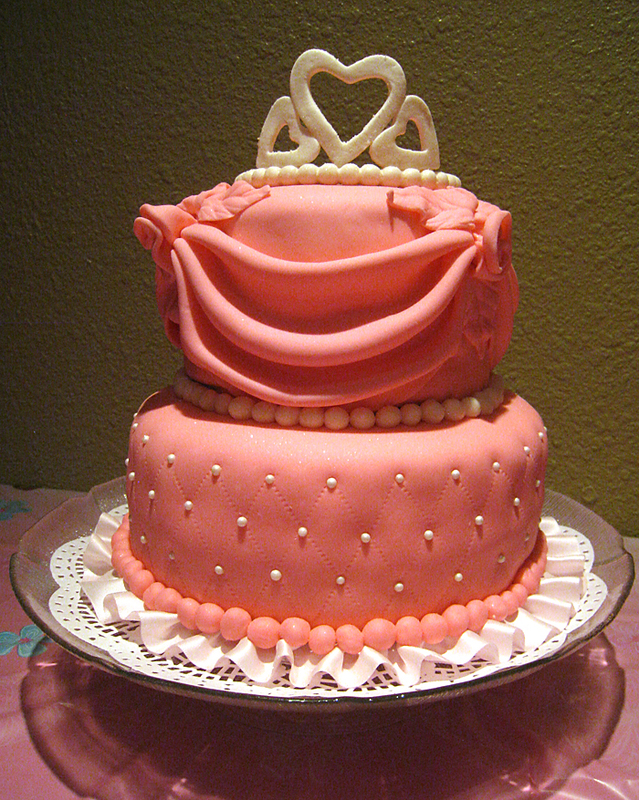 Quilted princess cake with pearls, drapes, pink fondant roses and gum paste heart tiara. I was only home for a few days, but in that time I had had to get two cortisone shots; one in each hand. So, I wouldn’t be able to do any details for the cake ahead of time. It would have to be simple and quick. As for the cake I thought I would go with swirled pink raspberry and white, vanilla frosting and pink marshmallow fondant. Since I’m not sure how many people will be at the party so this is a good choice. I make two cakes to do the swirl so it will be a larger cake. I found a satin ruffled trim at the fabric store and thought that it would work around the bottom of the cake board. I’d quilt and pearl the bottom tier… that’s as far as I got in the planning. I baked the cakes, making one a white cake with added vanilla pudding and the raspberry cake using raspberry jello for flavor and color. Two-layer 8″ rounds and two-layer 6″ rounds. The little kids at the party were going to have different stations to play at; finger painting, drawing, blowing bubbles and play dough. While the cakes were baking I got online and looked up “Homemade play dough”. I tried both the Jello and Koolaid recipes I found on Pinterest. My opinion is that the Koolaid play dough is the winner! I found Koolaid for .10 a packet; add flour, salt, cream of tartar, oil and water and there you have it. It’s a good smelling and quick playdough. I didn’t like the way the Jello recipe needed to be cooked and if not done right, was sticky. I was able to make 4-5 Koolaid recipes while the Jello recipe was cooking. When running my other errands I went to my sister Karen’s house to have her make the marshmallow fondant. It was a little too much kneading for my hands just yet. Not to mention the fact that she makes it so fast and seems to know how it will turn out when cool. Since the fondant is better after resting overnight it needed to be made friday. Home again and time to get the cakes frosted. I had to frost while the layers were still very cold. I noticed that when the cakes came out of the pans the edges were a little fragile. I guess when I baked the cakes and used the wet leveling strips around the pans, they overlapped too much and prevented the cakes from baking evenly. Lesson learned. I’ll purchase another set and cut them to my pan sizes. I placed the cakes in the refrigerator until the next day. 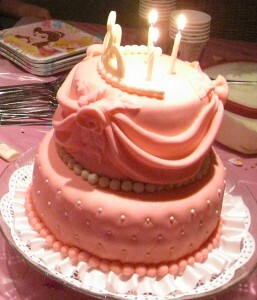 Princess cake all lit up with candles. Figuring out the draping took a little time. How thick? What shape? How many folds? Trial and error is how I did it. After figuring out the shape and size, the three drapes around the tier went smoothly. But what to do where the drapes met? I ended up making rolled fondant roses; quick and easy on the hands. The leaves I did cut out with a cookie cutter and used a veiner for detail. The cake was all ready to transport. The rest I would figure out and finish once I get to party central (granddaughter’s house). Making a lot of little balls to go around the bottom of the cake seemed to finish it off nicely. The ruffled trim added a softness to the cake and I liked the way it looked. I decided to add the smaller white balls to the bottom of the top tier. But if I was to do it again, I would probably make them pink also. The tiara was a last minute thing. I wanted a sparkly something, so I made the tiara out of white gum paste and dusted pearl powder over it. When I noticed the dust on the fondant I like the look so ended up dusting powder lightly over the cake. The day of the party was beautiful for an outdoor party. Still hard to believe it’s the middle of October! The Koolaid play dough was a hit. And just to let you know… it does not dry out like the commercial Playdough does, even when used outside. We were able to pack it all away for another day! 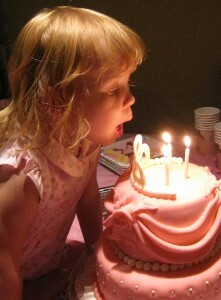 Our three-year-old princess blowing out the candles on her princess birthday cake. All went well until the cutting of the cake. I lit the candles, everyone sang Happy Birthday, she blew the candles out, everything was going great. Then Elisabeth did not want me to cut the cake. She leaned in, took the tiara off with her teeth. Not sure where this was going… I took it from her and explained that we could do something with that later. That seemed to be okay. But then she leaned in and took a bite out of the top edge of the cake! I explained that I was going to cut the cake so her friends could have some and she shook her head and said, “No cut, I wanna eat it!”. I said… “How about I take the top tier off and save that for you while sharing the bottom with your guests?” No. That was not good either. After few more tries to get her to understand, her mother took her away to calm her down. I did realize she totally understood; she just didn’t want it that way! I went ahead and cut the cake for the kids and parents and she soon came back, ready to get a piece of her birthday cake. Wow… It’s tough to be three! A special birthday this year. Not one of the big ones normally celebrated, but an important one for Mom and the rest of us. She had just had a knee replacement (three weeks prior) and her goal was to make it to a lunchtime barbecue at the golf course, which coincidentally was being held on her birthday. Dad had the idea that I should make a cake, as a surprise, for mom and we could share with the golf group. I loved the idea, but the fact was I was staying with them and wasn’t sure how I could make and decorate a cake without Mom knowing. For those out there that don’t know it…a knee replacement does not keep you down! The fact that it was unseasonably hot for October, in the high 90’s or 100˚, made things harder too. Since the invitations said it was a fall barbecue I thought colorful autumn leaves and acorns would make for a pretty cake. The area of the Sierra foothills where my parents live have oak trees so I went out and collected some acorns and toppers. As soon as my sister came over, bringing some tangerine curd she’d made for me, I took off to my son’s house, about 45 minutes away. (Telling my mom I hated to be so close to my family and not see them; I would take the opportunity to do so while my sister was there.) I would use my son’s kitchen to make the cake. This was going to be a fast one! I would only be gone for 24 hrs. But it is one of the more involved cakes I bake. An orange and white swirled creamsicle-flavored cake with tangerine curd filling, served with orange whipped cream. 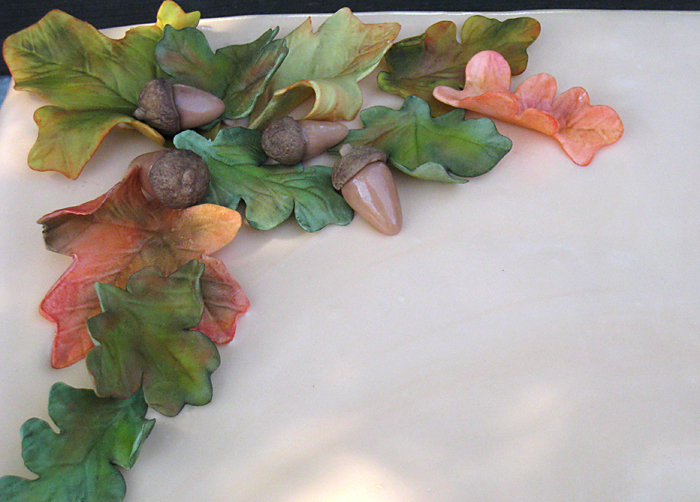 Colorful oak and maple leaves with acorns on autumn themed birthday cake. Using some fast molding putty I made 4 molds of acorn toppers. That made the creating of the acorns go much faster. As soon as dinner was over and my little granddaughters went to bed, I started on the making of the cake. Knowing I would have to wait up for the cake to set for awhile before taking it out of the pan, and then cool completely before wrapping and freezing, I was in for a long night. While the cake was baking I started with making gum paste maple and oak leaves. I had found some leaf cookie cutters at Michael’s. They weren’t exactly what I wanted, but a good start. I was also lucky in that I had fondant left from a cake I made a few days before. 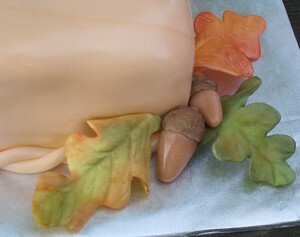 I decided to choose a final fondant color after I finished the leaves. The cookie cutters worked for quick cut outs, then I used my tools and refined the edges and added veining, placed them on crinkled foil for shaping and at that point blessed the hot weather for the quick drying time! Time for the cake to come out of the oven and for me to set my alarm so I could remove the cake from the pan. Then again for 2:00 am so I could wrap it when cool and freeze it. Closeup of gum paste autumn leaves and acorns. The next morning I started by adding color to the leaves and acorns with petal dust. As much as I hate that summer is over the leaves truly are pretty. I think the cake helped me switch seasonal gears. Luckily, I had some fondant left from the shower cake I made a few days earlier! 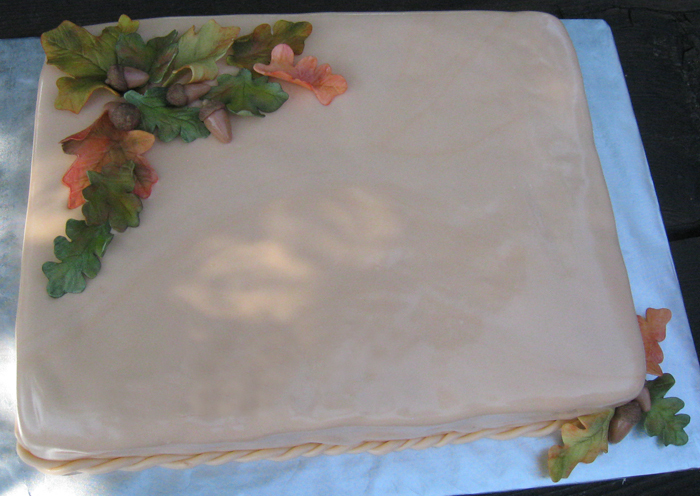 I really liked the soft orange that some of the leaves had on them so decided to go with that color for the fondant. The hot weather was really affecting the fondant. It just wanted to be sticky. I kept kneading in powdered sugar as I colored it and had no choice but to go with it. I set it aside for a few minutes to rest some. I piped some orange flavored frosting around the edge of the first layer of cake and then spread the tangerine curd within the frosting. I added the other layer and crumb frosted the whole cake. The fondant actually went on pretty good… I added a fondant rope trim around the bottom of the cake then set the leaves and acorns in place. Orange and vanilla creamsicle flavored cake covered with light orange fondant and filled with tangerine curd. I had to refrigerate the cake after putting the fondant on. I don’t like to do that, but since I had to drive for 45 minutes, during the hot part of the day, I figured getting it cold first and then placing it in a cold sack would give me a chance of it surviving the heat. My goal was to get it to my parents’ neighbor’s refrigerator. Since I turned up the AC in the car all went well. Safe and sound for the night. The guys took the cake to the golf course refrigerator in the morning when they went golfing. We would meet them later for the barbecue. The trick now was to get the orange flavored whipped cream made. In my mom’s kitchen. Without her knowing! I waited until she went to get ready for the barbecue and immediately rushed to get the ingredients out and the mixer set up. I figured I had as long as her shower would last. I got it whipped up, put in a tub and stuffed in the back of the fridge. Then I went on to clean up the mess I made, including stuffing the whipping cream cartons way down in the garbage. Whew! This keeping it secret stuff gets tricky. I gave my sister the whipped cream and a spoon to take with her in her car, while I drove Mom in her car. My sister got there first and was able to get the whipped cream in the fridge before we came in. The weather had cooled down by 20-25 degrees; it was a perfectly lovely day for a barbecue. We had a great lunch and then surprised Mom with the cake and everyone singing Happy Birthday to her! Leaving the cake in the refrigerator had done the job and since we were cutting it immediately it didn’t have a chance to get too gummy. Although cutting it was not as easy as usual. One guest wanted to know why the frosting looked like plastic! Okay… it was a bit shiny. All-in-all it tasted great. This one I’m writing down for sure.